Features: Please read ad & review images. Over a dozen models both Men & Lady models. MOSTLY Chronos!!! 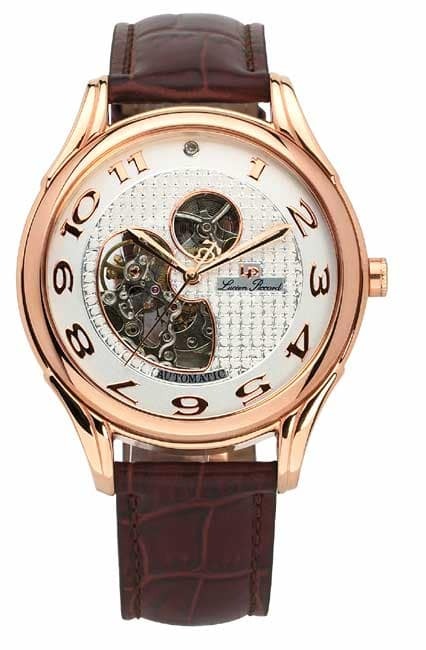 Lucien Piccard 26561RO Skeleton Automatic With Display Reverse! Rose automatic, Model 26561RO, strap with double deployant, 3 ATM, 44mm x 52mm with lugs, diamond at 12, new Demo CLOSEOUT SPECIAL! Retail was many hundreds... Sell for $265 or trade! Lucien Piccard 2-Tone 26504CH Diamonds Hourly Automatic With Display Reverse ! 2-Tone automatic, Model 26504CH, Small diamonds at hour markers, 2-Tone bracelet with double deployant, 3 ATM, new Demo CLOSEOUT SPECIAL! Retail was many hundreds... Sell for $285 or trade! 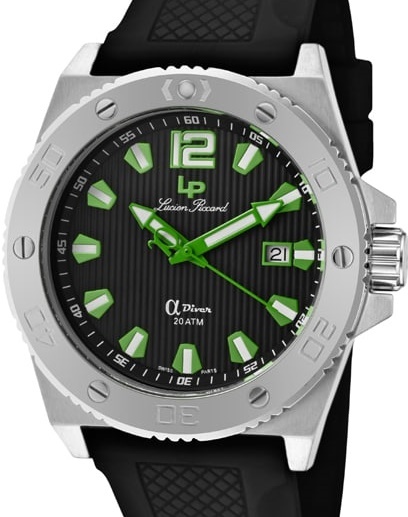 Lucien Piccard Diving Watches! CLOSEOUT SPECIAL! Stainless 200 meter with date... Black rubber straps. Japan with Swiss parts movement were $695 retail... new closeouts. Bright & STURDY for diving. Have either Green, Blue or Silver accents for indexes & on numerals, large 44 mm x over 50 mm with lugs! Sell for $135 each, $350 for ALL 3 or trade! 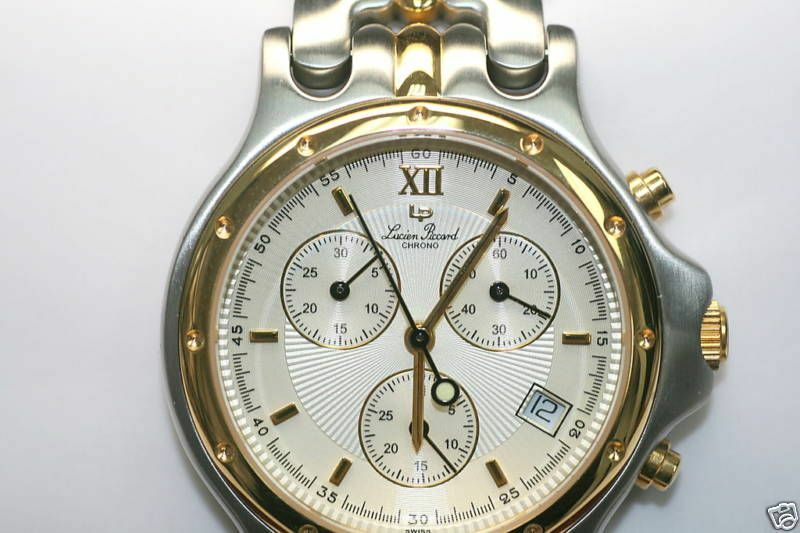 Lucien Piccard SS Chronograph 26499GY! Many Available! CLOSEOUT SPECIAL! Retail was many hundreds... Sell for $245 or trade! 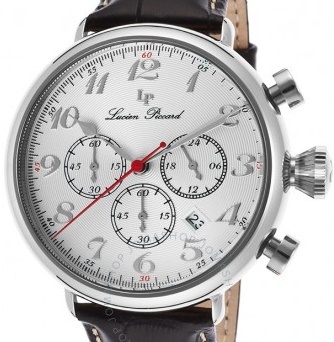 Lucien Piccard 2-Tone Chronograph 26450CH! Many Available! CLOSEOUT SPECIAL! 2-Tone with date at 4, Model 26450CH, 2-Tone bracelet with deployant, Japan movement was $450 retail... new closeout. 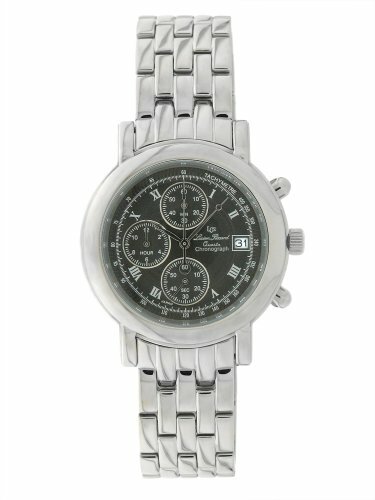 Popular 2-Tone Chronograph, 37 mm x over 44 mm with lugs! Quantities are available! CLOSEOUT SPECIAL! Retail was $450... Sell for $155 or trade! Lucien Piccard 2-tone Men's 26022D Diamond Hour Indexes, 2-tone bracelet! Many Available! 2-tone Diamond hour indexes, Men's model 26022D, Swiss movement, Sapphire crystal, 2-tone SS link bracelet, double-push-button-fold-over-safety clasp. Sapphire crystal, date, 160 feet, Swiss-Quartz movement, 36 mm x 40mm with lugs. Quantities are available! CLOSEOUT SPECIAL! Retail was $595... Sell for $195 or trade! 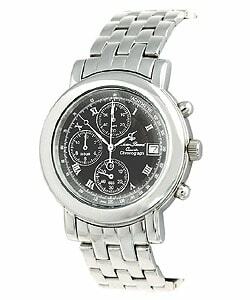 Lucien Piccard Men's 26499GRY Chronograph With Bracelet & Deployant Clasp! MANY Available! Japanese-quartz movement, Chronograph, Case diameter: 39 mm, Stainless, Gray dial, date function, 330 feet, push-button double folding Deployant clasp. Several available! Lucien Piccard Men's 26781 Goldtone With Bracelet & Deployant Clasp! Several Available! CLOSEOUT SPECIAL! Japanese-quartz movement, Dress, Stainless Goldtone Black dials & Gold Dials, seconds at 6, Deployant clasp. Only Seven with Black dials plus 2 with gold dials available! Retail was $475... Sell for $125 or trade! 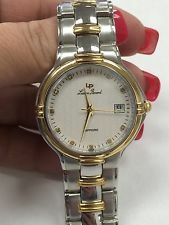 Lucien Piccard Ladies 26281 Goldtone With Bracelet & Deployant Clasp! CLOSEOUT SPECIAL! Japanese-quartz movement, Sapphire Crystal, Dress, Stainless Goldtone, double Deployant clasp. Several available! Retail was $395... Sell for $120 or trade! Lucien Piccard Mid-Size 26478 2-Tone With 2-Tone Bracelet & double Deployant Clasp! Quantities Available! Model 26478, Swiss-quartz movement, date, Sapphire crystal, Mid-Size, 33mm, Unisex dress version, Stainless 2-Tone, White dial, 100 feet, double folding Deployant clasp. Several available! Retail was $375... Sell for $135 or trade! Lucien Piccard Mid-Size 26784D 2-Tone Diamonds At Each 5 Minutes With 2-Tone Bracelet & Deployant Clasp! Quantities Available! Swiss-quartz movement, model 26784D, Sapphire crystal, Mid-Size, 34mm, date, Diamond hour markers at each 5 minutes, Unisex dress version, Stainless 2-Tone, White dial, 100 feet, double folding Deployant clasp. Several available! Retail was $525... Sell for $155 or trade! 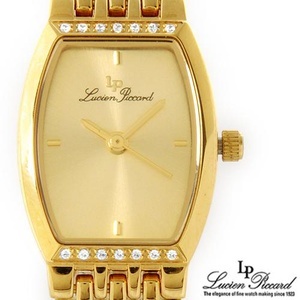 Lucien Piccard 27100MP Ladies Diamonds On Case, Dial & Bracelet, SS bracelet! ONLY Two Available! Lucien Piccard, Ladies's Watch, SS, 17100MP, affordably elegant, bezel diamond accented also a few on bracelet, White mother-of-pearl dial has one oversized Roman hour marker at nine o'clock that with eight 1 mm Blue sapphires. Virtue's stainless steel panther bracelet has a deployant buckle clasp too. Water resistant to 3ATM, this beautiful Lucien Piccard creation is protected by scratch-resistant sapphire crystal, Swiss-quartz movement! Retail was extremely high... one of the largest internet retailers had it well over $1K... sold out now but ad still showing... Sell for $450 or trade! 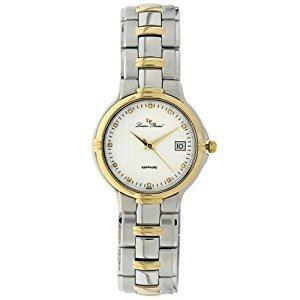 Lucien Piccard SS Ladies 23269WH! 'Happy Diamond' Seven Floating Moving Diamonds In Bezel, SS bracelet! ONLY 5 Available! 2-tone Diamond hour indexes, Women's model 26369WH, SS link bracelet, double deployant clasp. 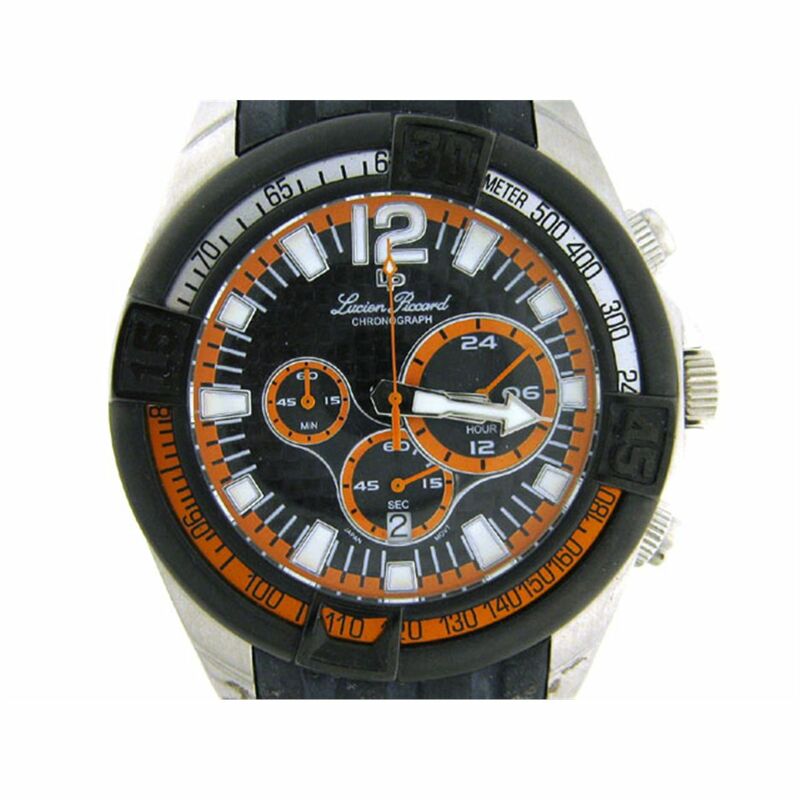 Sapphire crystal, Swiss quartz movement, ONLY 5 available in Happy Diamond model! CLOSEOUT SPECIAL! Retail was several hundred... Sell for $140 or trade! 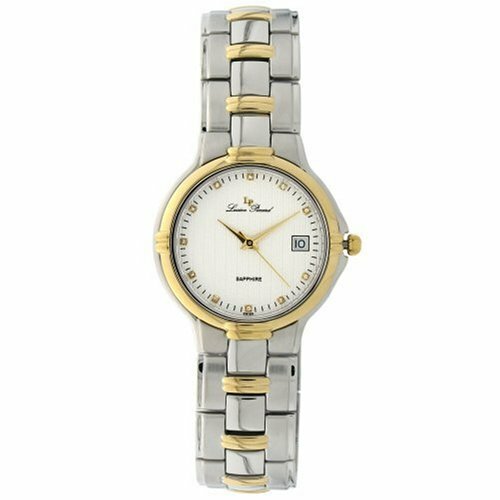 Lucien Piccard 2-tone Ladies 26023D! Diamond Hour Indexes, 2-tone bracelet! Many Available! 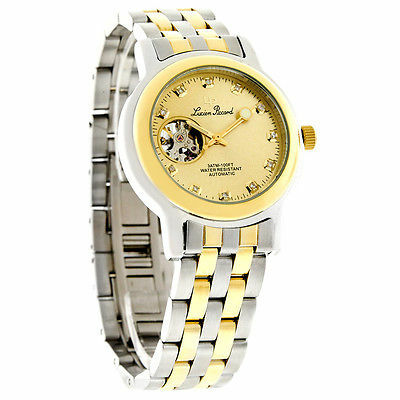 2-tone Diamond hour indexes, Women's model 26023D, 2-tone SS link bracelet, double-push-button-fold-over-safety clasp. Sapphire crystal, date, 160 feet, Swiss-Quartz movement, 27.5 mm. Quantities are available! CLOSEOUT SPECIAL! Retail was $595... Sell for $175 or trade! 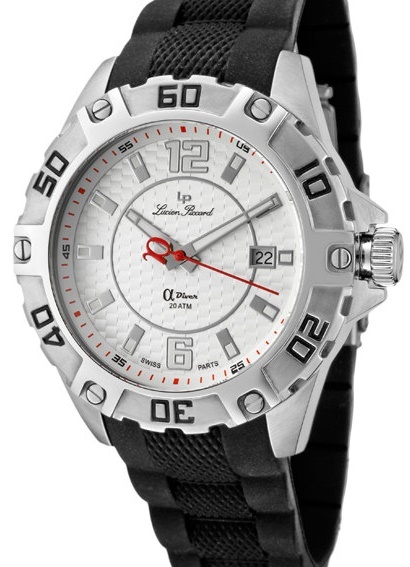 Lucien Piccard SS Ladies 27069 With SI/GH Diamonds! Many Available! Ladies Lucien Piccard watch for lady adds a touch of elegance, Silvertone stainless steel case, only black leather strap with Deployant clasp, Mother-of-pearl dial, Silvertone hands and diamond markers, Diamond-accented square bezel with 0.32 total carat weight, SI1-2 clarity, and G-H color, Second hand, Water resistant to 30 meters, Sapphire crystal, Swiss movement! Quantities are available! Retail was $525 Sell for $245 or trade! 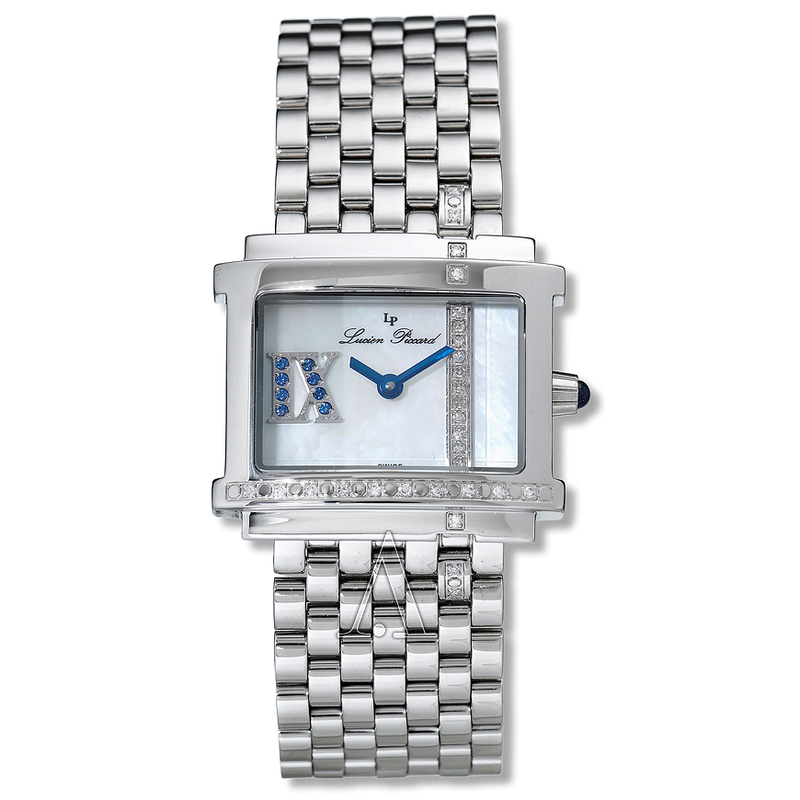 Lucien Piccard SS Ladies 27070 With Diamonds In Dial! Many Available! CLOSEOUT SPECIAL! Ladies Lucien Piccard watch, White Mother-of-Pearl Dial with Diamond markers at 3, 6, 9 & 12, stainless steel case, only Black, Pink & Red leather straps with Deployant clasps, Swiss Quartz movements, Sapphire Crystal, Black with double Deployant clasp. Quantities are available! CLOSEOUT SPECIAL! Retail was $395 Sell for $135 or trade! 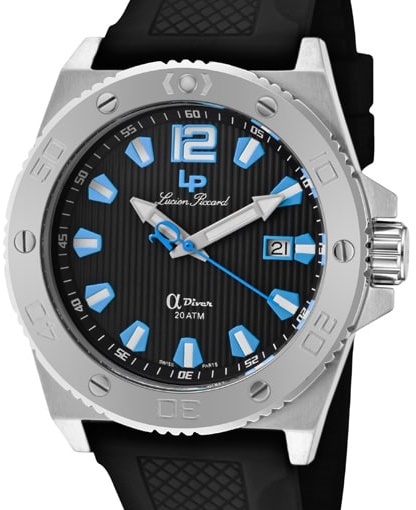 Lucien Piccard SS Ladies 27033 With ! Many Available! 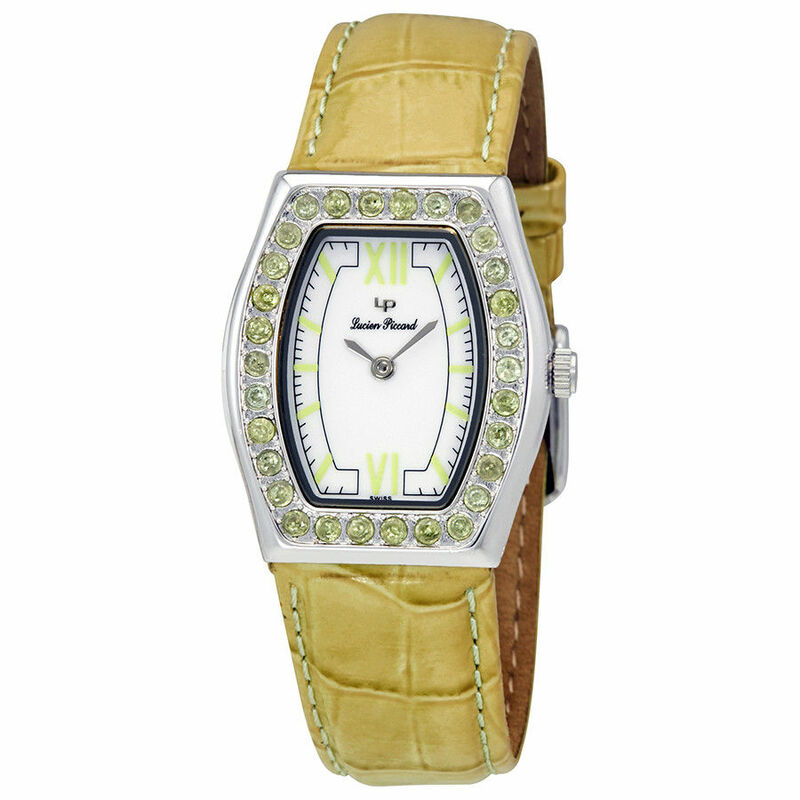 Ladies Lucien Piccard watch, Silver-tone brass case with a LIME COLOR leather strap. Fixed crystal-set brass bezel. White dial with silver-tone hands and index and Roman numeral hour markers. Minute markers around the outer rim. Dial Type: Analog. Swiss Quartz movement. Pull / push crown. Stainless steel case back. Tonneau case shape. Tang clasp. Water resistant at 30 meters. Functions: hour, minute. Casual watch style. 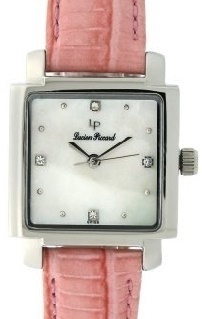 Lucien Piccard White Dial Tonneau Ladies Watch Quantities are available... now only 19 left! 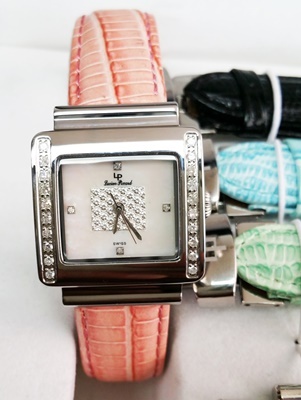 This ladies watch has the Swiss style & look! Retail was $395 Sell for $100 or trade! Stainless 100 meter with date at 4, strap. Japan movement... new closeout. GMT/Chronograph. Silver dial with Black numerals, 45 mm x over 50 mm with lugs! Retail was $595... Sell for $155 or trade! Stainless 100 meter with date at 6, strap. Japan movement was $695 retail... new closeout. Chronograph/Tach. White numerals with Orange accents & movable Tach bezel, large over 47 mm x over 53 mm with lugs! Sell for $165 or trade! Payment Details: USA Checks OK... Bank Transfers ONLY Worldwide! WE TRADE!